As of August 2015, Pioneers for Pioneers, the student fundraising campaign that falls under the ASLC banner, has raised $15,647, which has resulted in five scholarships or “opportunity grants” given to students. These “opportunity grants” are awarded according to “an effective and efficient needs-based distribution matrix” through teaming up with the Office of Financial Aid. This money is meant to offset students’ “cost of attendance”, which is outlined on the ASLC website as direct costs, defined as tuition and fees and on-campus room and board, or indirect costs, defined as transportation, personal expenses, books and supplies, and off-campus living allowances. Most importantly though, Pioneers for Pioneers advertises its “students-helping-students” philosophy, where currently enrolled students are the ones making donations. President Barry Glassner, Trustee Ruth Sigal, and Trustee Tony Abena match these donations. I want to be clear that I think it truly is a noble idea for students to take the high cost of tuition and living expenses into their own hands. Those of us privileged enough to attend such an expensive school, clocking in at $58,494 for a student living on campus with a meal plan, not to mention an estimated $3,102 for books and transportation, know first hand how frustrating it is to fall short on tuition. However, this is where Pioneers for Pioneers fails. 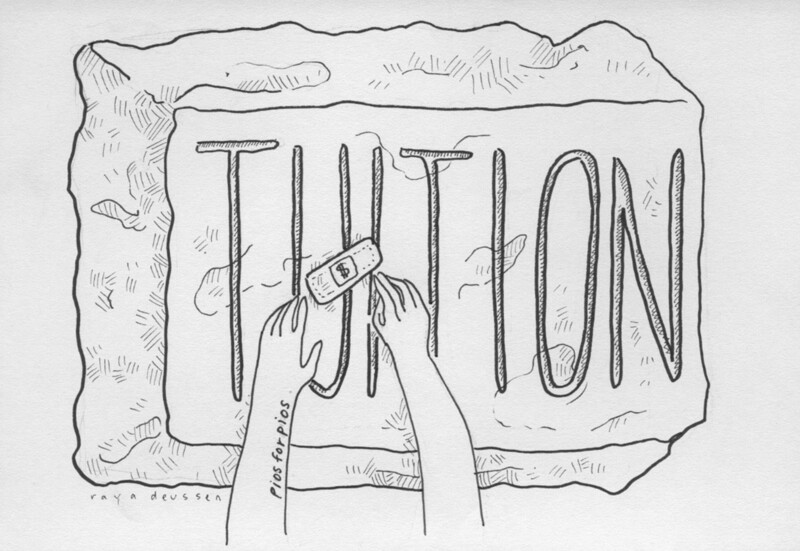 Pioneers for Pioneers as a program is putting a band-aid on the issue of tuition affordability. While it is admirable for students to offer a potential method to help with college affordability, Pioneers for Pioneers in practice has not been as successful as it was intended to be. Students have an excess of talent. We have an excess of skill and manpower, and when push comes to shove, we have an excess of time. Yet the statistics show that the majority of the student body does not have an excess of money. If LC and ASLC really want to foster a sense of philanthropy in the current undergraduate student body, wouldn’t it be more realistic to tap into these excesses, which allow students from all financial backgrounds to participate? In the 3 years since its inception, Pioneers for Pioneers has only raised $15,647, which was given in the form of 5 scholarships. Compare this to the $36,755,466 that this year alone went to students who demonstrated financial need. This is not to say that what Pioneers for Pioneers is doing is a mere drop in the bucket. It is vital that students on campus are given a viable path through which they can pay for their college tuition. However, the statistics and social implications of the Pioneers for Pioneers program show that while the idea of students helping students is a noble one, in practice it is not helping to manage the tuition affordability problem on campus. Rather, it is putting a band-aid on a crucial issue in the name of philanthropy.